I am so excited to share with you all that this year we have been picked by Tots100 to be a Bostik blogger. This means that each month we will have a step by step craft tutorial for you. Using a craft box sent to us from Craft Merrily. I’m really looking forward to sharing with you the different things we make. Also I’m looking forward to this one on one time with Ava doing something we both love. This month in preparation for valentine’s day we have been making some valentine’s bunting. 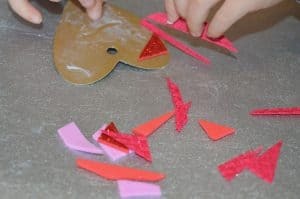 This is a great activity and can be enjoyed by children of all ages. First of all you will need to decorate your heart shapes. As a toddler and a glue stick can be messy we used opted to use some Glu dots. I simply placed them on different parts of the heart and then let Ava decide what she wanted to stick on them. 2. 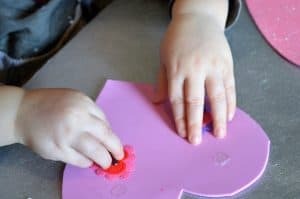 Once you have decorated your hearts you will need to make a small hole using a hole punch in the top centre section of your heart. To put a pipe cleaner through for hanging. As I used foam for some of my heart I didn’t need to use a hole punch as they cut through the foam with ease. 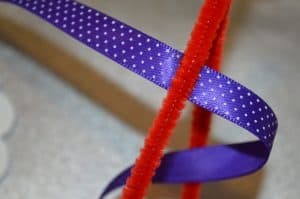 Once you have put the pipe cleaner through this hole twist the end of the pipe cleaner together so that you can thread them onto your ribbon in a moment. Repeat this for all of your hearts or hanging decorations. 3. Then you will need to thread all of your hearts onto your ribbon. So that they don’t slip around and all end up at one end. I secured them in place using the Glu dots. 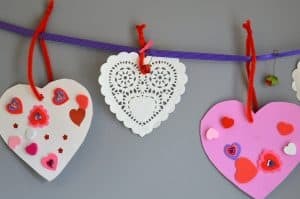 Now your valentines bunting is ready to put up. We used some White tack to put ours up as I have found that white tack doesn’t pull the paint off the walls or leave oily marks. Now for a really easy valentine’s card that can be done in no time at all. As I don’t like to waste anything I have used all the off cuttings from the bunting to help create this card so make sure you don’t throw them away. Firstly you will need a piece of A4 card folded in half. Draw a heart in the middle of it and cut it out. 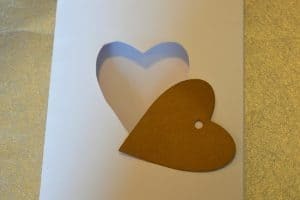 You can either use this heart to decorate for the focal point of your card or you can use another heart cut down to the same size. 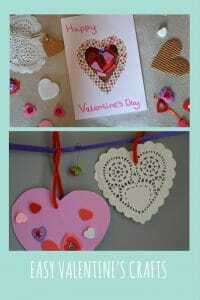 Once you have chosen which heart your going to decorate for the focal point . You will need make a small hole using the whole punch in the center top section of the heart. 2. Now remember those off cuttings I said about this is where they come into use. Use the off cuttings to decorate your heart. Making sure that the whole at the top is kept clear. I did at this point get a bit a bit brave and let Ava cover the heart in glue. You could if you wanted to use the Glu dots again. 3. Once you heart is complete you will need to threat some ribbon through the whole and secure it in place on the inside of the card so that it shows through you cut out section on the front. I then went around the cut out section on the front with some washi tape just to give it that extra bit of colour. Then all you need to do is write Happy Valentine’s day on the front, write you message on the inside and your done. A lovely valentine’s card to send to your loved one. I hope you have fun creating these if you do any of them please let me know how you get on i would love to see. Don’t forget to come back each month to see what we are creating next month we will be doing some Easter crafts. 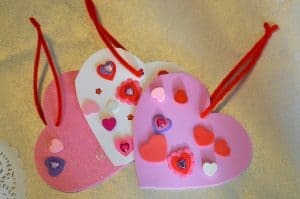 These crafts are lovely! Looks like you have had great fun together. I can’t wait until my daughter is old enough for things like this! Few more months hopefully! The Cards looks great. 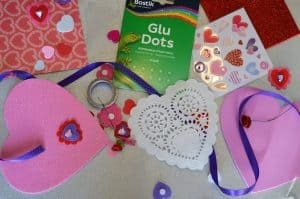 What a lovely way to involve children during Valentines. 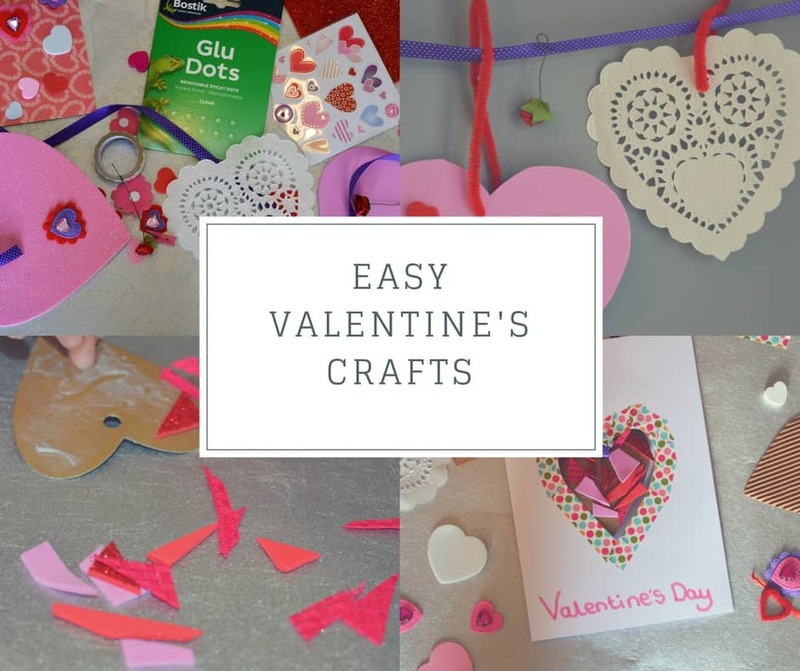 This is such sweet idea – we are on the look out for some Valentine’s crafts for the next couple of weeks so going to pin this for after school one day! These look like so much fun. I love the type of craft boxes that you get sent regularly and my daughter gets so excited when one arrives. She’s 5 at the moment and would still love this. This looks so cute and easy to make. I’d love to make something like this for myself, adding a personal touch to one of the rooms in our house. Well done on being chosen as a bostik blogger by Tots 100 that is awesome! I love the cute Valentines card! This is so creative. The card is a beauty. Wonder if my kids would be interested in making one. This is a great activity to teach with the kids. 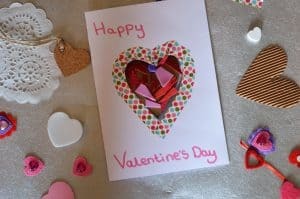 They can make their own cards for Valentine’s day. Well, I used to do that too before when I was young. Congratulations as well for being picked by Tots100! More crafts from you to look forward.